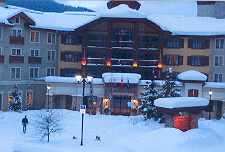 Less than an hour later, I arrived at my destination at the four star Delta Sun Peaks Resort on a bright, sunny, crisp winter day eagerly anticipating the activities I had scheduled during my visit. Although Sun Peaks is a year ‘round resort, most people who visit during the frosty months are there for skiing in the light, dry powder. 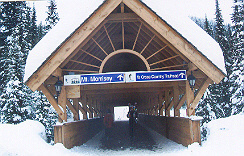 However, my plan was to participate in many of the lineup of winter activities available… minus skiing, even though the resort includes 122 runs on more than 3, 600 acres of ski accessible terrain in addition to a snowboard park, more than 18 miles of Nordic trails and powder filled bowls. And I was kept busy from morning till night having fun in the snow blanketed area. The Delta Sun Peaks Resort made points with me not only for its attractiveness and fine amenities, but for its conservation policies. After checking into my comfortable one bedroom alpine suite, I was off for two hours of snow shoeing. The Village Day Lodge, just minutes from the resort, was the jumping off place for all activities. There, I joined a good-natured couple from England who were first time snow shoers. Led by our knowledgeable guide Irene, we made our way through a picturesque covered bridge before donning our equipment. Irene briefed us on technique, the history of the area and of the sport and local lore while making our way through the natural habitat of local birds and animals and along paths through snow covered evergreens. We all enjoyed the two hour jaunt along the Valley Interpretive Trail then on to the Morrisey Ridge Trail, perfect for beginners, through this winter wonderland. Towards the end of our outing we welcomed a stop at a shelter with outdoor benches for cookies and hot apple cider. 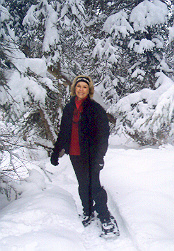 Snowshoeing is a sport for all ages and abilities where everyone can immerse themselves in the beauty of the Sun Peaks mountain resort’s open country as I did. The Tube Park looked like fun and I was happy that there was not a big crowd awaiting their turn. I hopped on the flat moving walkway which took me up the mountain to a designated tubing area. There I had my choice of two snow packed curving lanes, one a little faster than the other. I tried both and after one run on each lane, I felt confident that the more accelerated lane was fine for me. I sped, whooshed up a wall of packed snow and twirled down the runs several times, laughing all the way down….another fun winter sport for all ages. One evening, I hopped aboard a horse drawn sleigh pulled by two ½ brothers, a pair of enormous Clydesdales appropriately named Thor and Zeus. Witnessing the rapport between Paul, the man with the reigns, and the almost human understanding exhibited by the steeds was a delight. Obviously an ardent fan of these animals, Paul treated them with great respect and they in turn responded to his gentle voice commands. We clip clopped along, covered in blankets and sipping hot chocolate, for a little under an hour enjoying a ride in the moonlight through snow covered Sun Peaks. Snowmobiling offers the same thrills as motorcycling or jet-skiing, being one with your powerful, agile machine. One of my choices for an afternoon of fun in the snow began with a short mini-bus ride to snowmobile headquarters. After being outfitted with helmet and boots, I excitedly jumped on my snow-beast and took a few practice runs around the loading area since I had not been snowmobiling in many years. It all came back in a hurry and my guide and I were off. My previous experiences had taken me to wide open meadows and along trails far from any mountain edge. However, this route followed cat walks used by skiers to get from one downhill run to another but fortunately I did not have to share the path with any skiers or snow boarders during my outing. We emerged on to a snow covered logging road where I watched a great evergreen being felled before continuing on. My guide led the way, watching carefully to make sure I was doing OK as we zipped along in the snowy back country of Sun Peaks. Another exciting winter sport, dog sledding, allowed me both the choices of participating as a musher or relaxing asa passenger. At the Have a Howl Dogsled Tour, I spent some time just getting to know some of the dogs, Granite, Marble, Floppy and Spot before helping to bring the team of Alaskan Huskies, one by one, down to the sled. This adventure through the glistening white countryside had me breathless when I jumped off the sled going up hills to help the dogs pull less weight…. definitely a cardio workout. Down the hills and along the curving paths as a musher proved exhilarating as the dogs eagerly ran the snowy course. One late afternoon I treated myself to a pampering 90 minute massage at the Sun Peaks Spa, a perfect way to end an active day. I chose a lavender aromatic complex as my preferred fragrance for the spa’s Signature Massage before disrobing and climbing onto the massage table. My petite massage therapist’s strong hands belied her stature as she kneaded tight muscles followed by hot stones which she stroked along my back. I responded to her confident touch as I grew more and more relaxed while she finished off with a most welcome scalp and foot massage. Each day as I made my way through the town from the hotel to the Village Day Lodge I stopped to browse in the eclectic offering of boutiques and tried out a variety of local restaurants. I was fortunate to visit the area during the 11th annual Sun Peaks Icewine Festival, five January days of decadence celebrating the culinary side of Sun Peaks and the wines and ice wines of the prestigious Okanagen wine region. The festival offers an opportunity to experience the marriage of wine, food and outdoor recreation. 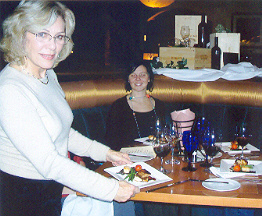 While there, I enjoyed a sumptuous dining experience, courtesy of the Delta Sun Peaks Executive Chef David Tombs of the delightful Mantles Restaurant & Bar. Tombs specializes in using local, in-season, fresh, high quality ingredients to create unique and delicious dishes. Each of the petite, gourmet, picture-perfect six courses which I indulged in was accompanied by one of the area’s fine wines including a Chardonnay-Semillion, a Gamay Noir, a Cabernet Sauvignon and concluding with a goblet of the event’s namesake, an Inniskillin Vidal Ice Wine, a memorable finale to my winter visit to beautiful and exciting Sun Peaks, British Columbia, Canada.